This morning on my walk back from the gym I was reminded why Finsbury Park is awesome. On my route I pass a grocery stall where a friendly man sells fruit and vegetables in £1 quantity bowls. Amongst other things, I bought 4 red peppers for only £1, a bargain compared to the supermarkets. So walking back with my heaving blue plastic bags I got the idea into my head that I wanted to make roasted red pepper soup and I’ve been excited all day planning it. Although this is a fairly simply recipe, the roasting takes some time in order to get the best flavours from the peppers and tomatoes. If you’re really rushed for time you could add them to the pot raw and boil them, but I hope I can persuade you that the roasting is worth the wait. I have a love/hate relationship with cooked peppers, so this is quite an unusual meal for me to cook. I wouldn’t normally eat them except when my parents make peperonata (an Italian dish of sliced roasted peppers with olive oil, garlic, and sometimes olives and capers; also known as peperoni in Italy). However, over a year ago I went to a sweet little tea house with my friend Sophie and we had red pepper soup which was absolutely delicious. I have no idea what they put it in but it was scrumptious. Since then, I don’t think I’ve eaten it again and certainly never made it until now, but I was so excited to try. The smell of peppers and tomatoes roasting in the oven is absolutely delicious. I was tapping my feet and staring into the oven for a large part of the afternoon! 1. Preheat the oven to 150 degrees. 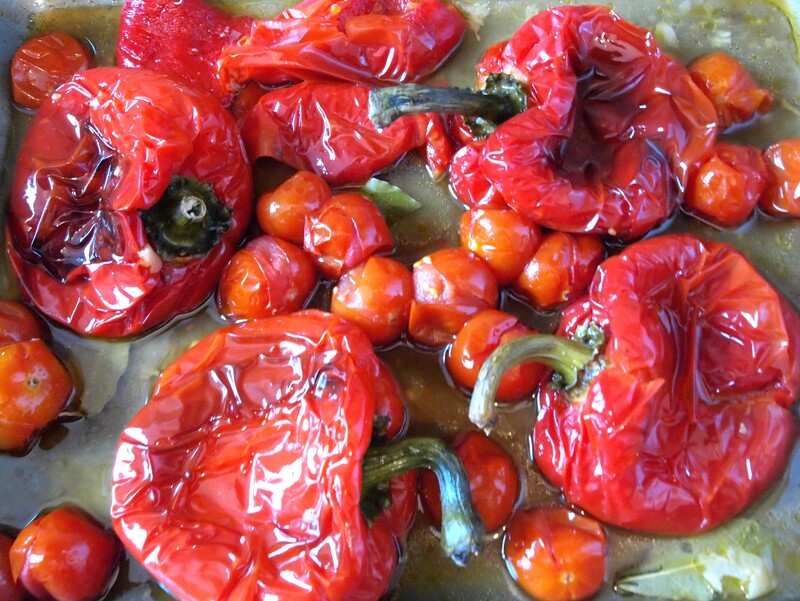 In a large tray, add the olive oil, garlic cloves and the peppers, whole and washed. Roast for about an hour in the middle of the oven, checking once or twice and turning the peppers. 2. Add the cherry tomatoes and bay leaves and sprinkle with salt and pepper. Cook for another half an hour. Then, add the basil and turn the tomatoes and peppers. 3. In a large pot, heat the butter and a drizzle of olive oil. Add the red onion and cook on a low heat with the lid on until soft. Add everything from the oven tray into the pot, except the bay leaves and peppers. Put the lid on and let it cook slowly while you prepare the peppers. Don’t worry about all the liquid from the roasting tray, the cherry tomatoes release a lot of water in the oven which adds a beautiful flavour. 4. Pull off the pepper stalks and discard. Slice each pepper down the middle and scoop out all the seeds. Then, peel off the pepper skins. Add the soft cooked peppers to the pot and stir in. Add the stock, chopped parsley, tomato puree and dried herbs. Cover and simmer for 20 minutes. 5. Turn off the heat. Blend the soup, and then pass through a sieve to get rid of any rogue pepper seeds and to smooth. Return to the pot and add the cream, salt and pepper (to taste). 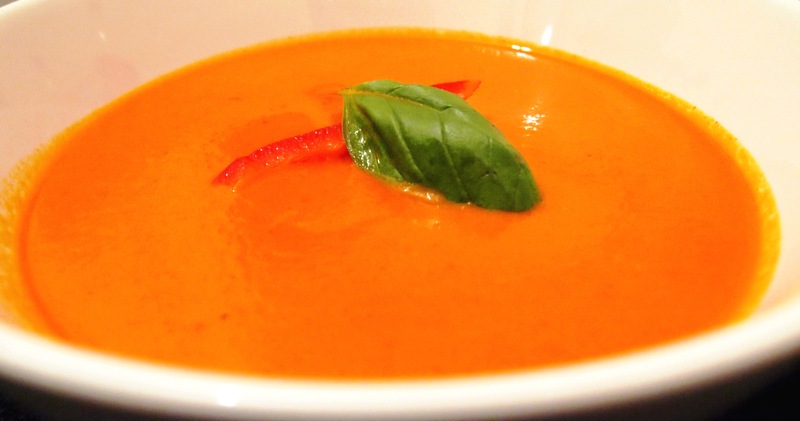 You should now have a rich orange coloured creamy and smooth soup which tastes absolutely divine. Serve with your favourite bread as a starter or main. It should last a few days in the fridge. All written content and photographs copyright Vered © 2011. All rights reserved. Posted in Recipes and tagged cooking, eat, food, photo, photography, recipes, red pepper, roast, soup, tomato, vegetarian. Bookmark the permalink.